Money in the Garage: Don't be puzzled at the garage sales! Feeling a little intimidated over the variety of garage sale items you can sell on eBay? It can be overwhelming trying to remember the multitudes of stuff; Coca-Cola, Pyrex, Tupperware, Nike, NorthFace...the list goes on and on! I know from experience it's hard to keep it all straight in your head. But I have an easy one for you to remember...children's puzzles. Puzzles are easy to find at garage sales and just as easy to sell on eBay. Not just any puzzle though. I am not talking about those cheap cardboard types found in toy aisles from Walmart to Walgreens. Those are worthless on eBay. You want to look for those heavy 12" by 8" wood puzzles. Lucky for you and for me, these puzzles are a fairly common find at garage sales. For some reason, people seem to save their wood puzzles rather then trash or donate them. I am not sure why. Maybe it's a combination of sentimental reasons and their durability. Wood puzzles hold up under rough play and can last a long time. So even after kids outgrow their puzzles, they seem to linger around the house. Eventually however, these heavy puzzles wear out their welcome and Mom hauls them all out to the driveway for the yard sale. Pricing is usually a happy surprise, I typically pay in the range of a quarter to a dollar per puzzle. When it comes to manufacturers, Playskool and Fisher Price wood puzzles always sell the best on eBay. Naturally, the older...the better. Occasionally, I'll find Playskool puzzles dating all the way back to the 1960's. 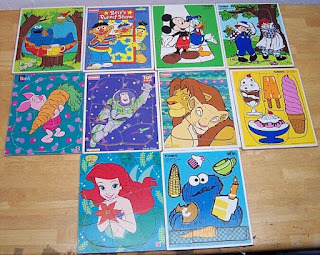 You can easily identify the age of these puzzles. The year can be found printed on the bottom corner. Most of the older puzzles depict simple themes such as Mother Goose nursery rhymes. The older puzzles also attract a separate niche of collectors willing to pay more. Buyers also love Disney or Sesame Street themed wood puzzles. Check out the group seen in the photo above. I found these ten puzzles at a garage sale last season. I paid a quarter for each, shelling out a major investment of $2.50! As you can see, all the pieces were intact and in nice condition. I sold them on eBay the exact way I found them-one big lot. Some sellers may disagree with this approach. You'll find on eBay auctions that list only one puzzle at a time. Unless you have a super-rare puzzle that will sell for major bucks, I think this one-puzzle per auction is a waste of time. Big "lots" bring "lots" of bidders, so throw them all in one auction! My lot was a great example of this, selling for a final auction price of $35 dollars! A puzzle profit of $32.50! However, I do have some words of caution before you sell. Wood Puzzles are heavy. If you're not careful, postage for these doorstops can go sky-high! To keep your shipping costs at a reasonable price, sell only ten puzzles at a time. Ten standard size puzzles can squeeze inside a USPS Priority Mail medium flat rate box. (It's a tight fit but it can be done.) Shipping costs for the flat rate box is only $11.35. To prevent the box from blowing out due to weight, make sure to wrap a few bands of strong shipping tape around the outside. So now you know puzzles can be an easy buy and sell. What kind of garage sale stuff have you found to be an easy eBay sale? Send me a postcard, drop me a line, stating point of view! Crystal-Ha! Thanks for getting the Beatles reference. I couldn't resist throwing it in there...and thanks for liking the blog! Duh! I should have gotten that Beatles reference. Silly me. The easiest thing I've been able to sell is skeleton keys. Right now they're hot. Hard to find though...and at a good price for resale. Your first paragraph summed up my feelings very well. I've been reading all these ebayer's blogs and my head is spinning. I tested the waters on some things I don't normally sell. So far a big fail. Maybe it's because I don't sell int'l. Yesterday I was at the SA, had some vests in my hand that I thought would be good Steampunk items, but I just couldn't get myself to take the leap. I put everything back. I'm more comfortable with hard goods. Speaking of which, I think I have a wooden puzzle in the basement....see ya! Miss Clamco-I will keep my eye out for skeleton keys, although I think in my area they'll be a harder find. I am still loving that Steampunk you told us all about...it's cool stuff that sells! One way I help myself remember new tips on stuff is the following: I find a listing for the hot, new item on eBAy and "watch" it. After the auction closes, I don't delete the watched item. I'll keep it on my watch list for weeks and months. The constant exposure to seeing the item on my watch list helps it seep into my overcrowded brain! Thank you for the great post. I run into these all the times at sales! Dude- Thanks to you I scored at a church sale yesterday! I was looking at the puzzles and the gentleman working told me he'd give me them all for a buck! At the same sale I found a bunch of vintage mugs and 4 ugly Christmas sweaters! Amanda-A buck for a bunch of wood puzzles? That's a great score! Sounds like my kind of church sale...glad I can help. Let me know how you do selling the puzzles...Dude!